An Award of Distinction in the 2018 MPIF Design Excellence Awards in the Hardware/Appliance Category went to ASCO Sintering Co., Commerce, California, USA, for a PM 316 stainless-steel radius-adjust head. The part goes into commercial water sprinklers where it is used to adjust the water pattern. The part was originally considered to be a MIM application but a collaborative approach between ASCO engineers and the end user enabled a conventional press and sinter PM solution to reduce raw material costs by 80%. 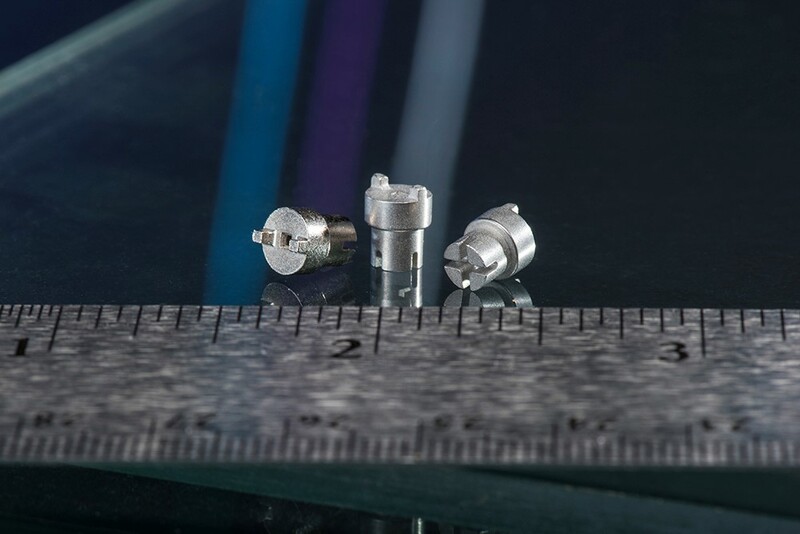 The part’s intricate geometry of a deep-cored hole opposing a deep feature, achieved by complex tool design and innovative press control realized a 75% cost savings when compared to traditional machining methods. The part is pressed to net shape with only resin impregnating and nickel plating as secondary operations. Then high temperature sintering in pure Hydrogen atmosphere achieves a density of 7.0 grams/cc, a tensile strength of 70,000 psi, yield strength of 45,000 psi, a 13% elongation, 48 foot-lb impact strength and HRB 65 hardness.